That’s no hallucination. It’s what it would look like if you were at center of the Milky Way, our home galaxy. Researchers combined NASA Ames supercomputer simulations with data from the space agency’s Chanda X-Ray Observatory to recreate what’s going on at the center of the Milky Way. The result is far out. The video above shows a 360-degree, high-definition view of the center of the Milky Way, known as the Galactic Center, from the vantage point of a supermassive black hole known as Sagittarius A. Drag your cursor around to take a tour. Or, if using a smartphone, move the phone around to reveal different views. What are you seeing? The colorful display shows the effects of dozens of massive stars with fierce winds blowing off their surfaces in the region a few light years away from the supermassive black hole. The winds blowing off the star giants feed into the supermassive black hole. You can see dense clumps of material, made up of hot gas emissions, streaming into the black hole. In the video, the blue and yellow colors represent hot gas. The red represents moderately dense regions of cooler gas, with temperatures of tens of thousands of degrees, and yellow shows the cooler gas with the highest densities. 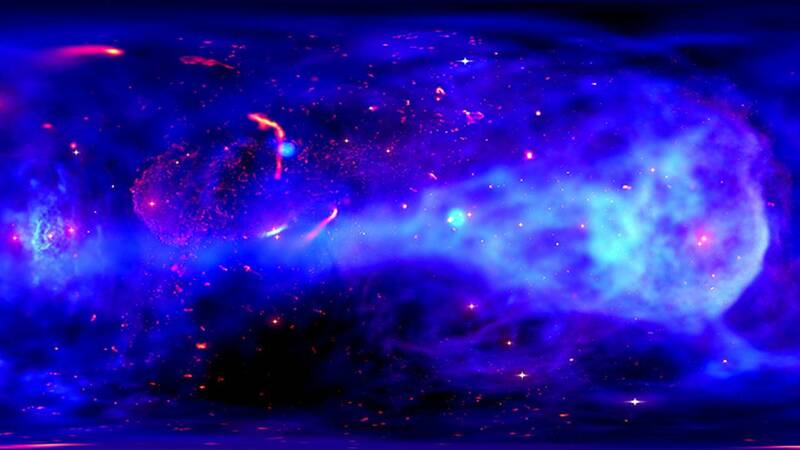 The video also shows collisions of fast stellar winds producing X-rays in the distance. Researchers believe it’s these collisions are the main source of hot gas seen by the Chandra X-Ray Observatory. Chandra X-Ray team members say this new visualization is a “sequel” to one of the Galactic Center released in January 2018. How to jump into the Milky Way experience: The 360-degree video of the Galactic Center looks amazing on a smartphone or computer but NASA officials say it's even better to view it through virtual reality goggles, such as Samsung Gear VR or Google Cardboard. Learn more about the Chandra X-Ray Observatory at Chandra.harvard.edu.